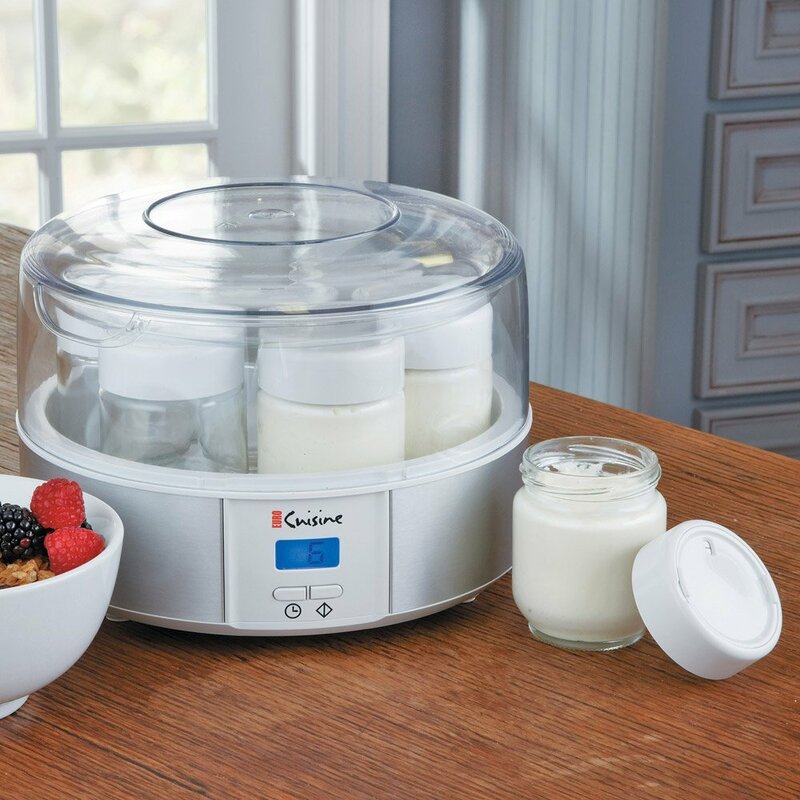 Finding the best yogurt maker for your needs isn’t always straight forward. It is true that there is no one size fits all solution. Despite having a simple job of providing heat for fermentation, some do it a lot better than others you still need to pay attention as you might end up getting the wrong model for your needs. There is one particular reason this is included on our list, and is the first yogurt maker we recommend. It is so important to have a shutoff timer if you’re looking for the absolute best yogurt possible. 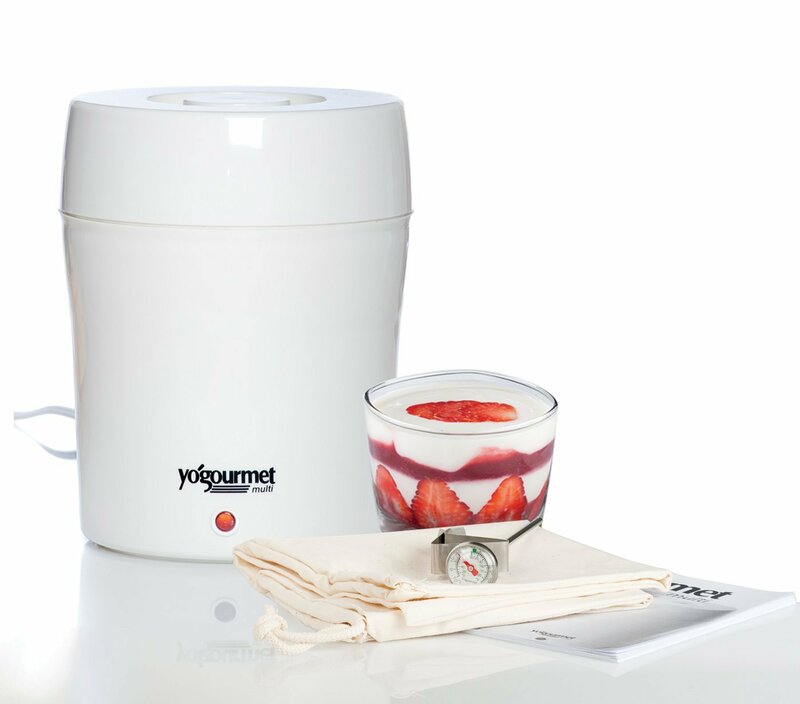 If you have a yogurt maker without one, it is vital to turn it off in time or your yogurt will over-ferment. One yogurt maker with a very effective timer is the Cuisinart CYM-100. Euro-Cuisine makers are great and their automatic shut-off function works. Some yogurt makers are guilty of trapping a lot of heat inside which keeps cooking the yogurt. That is where the Cuisinart CYM-100 wins. It goes into cooling mode when fermentation is finished. There is no other machine that does this. But this premium feature comes at a higher price than anything we have on this list. And instead of jars, this one has one large container great for making big quantities. The build quality is very pleasing like you would expect on a maker as expensive as this one. 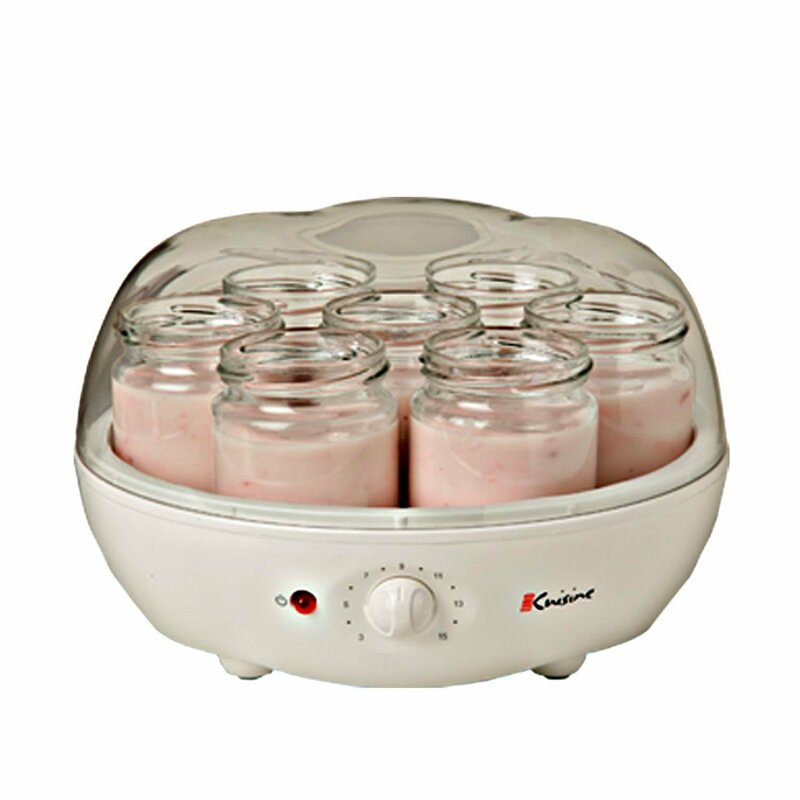 If you aren’t on a super tight budget, this should be the yogurt maker for you! 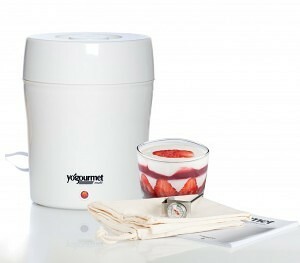 The Euro Cuisine YMX650 is one of the best yogurt makers you can get. And it is the one I first recommend to people who would like to do some serious yogurt making in the comfort of their own home. Even though it is not over the top in terms of features, it has everything you would expect in a yogurt maker, and doesn’t over-complicate. Starting with the build quality, the YMX650 is one of the most durable machines on the market. Coming to the jars, they are made of glass. This is a step up from the many yogurt makers on the market that come with plastic jars. Additionally, these jars are dishwasher safe. And as a bonus, they have lids with the option to include dates so you can keep track of when the yogurt was made, and make sure you eat it before it goes bad. The YMX650 has an automatic shut-off timer. And it takes it to another level with the inclusion of an LCD display which is a little easier and more fun to use than a dial. As for cleaning, the glass jars are as easy as they get. If you have a dishwasher, you can use that as well. Overall, the Euro-Cuisine YMX650 is a great yogurt maker and should be the first model you consider. The one thing we’re assuming is that you know all of the benefits of yogurt! It is a food with an amazing history and tons of health benefits. If you do need more info on the product these makers will be producing, you can head here to get it. If you have a big yogurt-eating family, then you might need to invest in a maker capable of handling large quantities. On the other hand, if you make yogurt for yourself only, it would be ridiculous to purchase one with the largest capacity. Yogurt makers range in capacity from those with only a single jar to those with 6 to 8. And in some situations, you might have a choice of purchasing a larger container to fit in the whole yogurt maker. Multiple jars become useful when you want to make different flavors of yogurt in one batch. Again, they are handy as you can simply grab one to take on the road. Since yogurt makers provide heat for fermentation, any unit will do the job as long as it can handle the heat-provision part well. With that said, it is, therefore, unjustifiable to go for something expensive hoping it will make a great yogurt maker. Perhaps, the only reason you might need to spend more is when you believe you are paying for durability or a certain special feature. You might also go for it if you think it will look elegant in your kitchen. Yogurt making takes time, usually up to 12 hours. Getting a maker with an automatic shut-off timer might prove to be helpful. This feature turns the unit off when the set time is over. So there is no chance of over fermentation which might affect the taste of your yogurt. If you are someone who does not have a problem remembering, or you’re at home and able to tend to your yogurt, you might not need a timer. Most yogurt makers will have an alarm that beeps when the set time is reached. However, this does not always turn the unit off. Yogurt makers can run with or without electricity. Each has its own benefits and drawbacks. But generally, the electric ones are better. They provide a constant supply of heat to the yogurt which is necessary for a great final outcome. The Non-electric ones, on the other hand, use hot water to provide the heat. The water normally cools after some time but overall, they also make good yogurt. The biggest advantage is that they can make yogurt anywhere. For example, these will make yogurt when you are out camping. It is a number one seller on Amazon and for a good reason. Almost everyone who has bought this is happy with it because, at its price, many would expect something a little more basic. But surprisingly, this maker does a superb job, is it the best yogurt maker? Starting with the jars, they are the same ones found in the YMX650 above. They are made of glass and are dishwasher safe. Many yogurt makers in this price range come with plastic jars which get discolored after time. Another surprising feature is the on/off light indicator (rare in this price range). As simple as it might appear, you will realize it is important when you head for bed without turning the maker on hoping you will find your yogurt ready in the morning. There is a single button you can use to turn the unit on or off. The YM100 is an upgrade of the YM80 in that it comes with an automatic shut-off timer. But this also means that the price had to increase, but only with $10. It is much like the YM80 in every sense but with only the inclusion of the timer. The question you need to ask yourself, therefore, is whether you really need the timer. The glass jars are the same and likewise, they are dishwasher safe. This one too has a clear lid so you can see how the process is progressing. The body design, again, did not change except on this model, there is a dial for setting the timer. If you are one of those against the idea of washing a bunch of jars, then you can get yourself one of those large containers. It fits nicely in the maker. This is not the most user-friendly yogurt maker on the market, but its ability to make great tasting yogurt is what has earned it a place on this list. Unlike other yogurt makers, this one uses a different system in cooking the yogurt. Specifically, it uses a water-bath system. This, as the manufacturer claims, makes for even heating of the yogurt. Whether that is true or not, what matters is that the yogurt tastes great. In addition to this, it comes with a large capacity container. If you are someone who does not like using jars, you might want to give this a try. So there it is! Our guide to the best yogurt makers on the market and some things to look out for when you’re choosing which yogurt maker to buy. We hope this has been helpful in your quest for perfect yogurt.